Were you surprised by the results of the Moscow mayor election? The answer for Muscovites may depend on what media they consume. The unexpectedly strong showing of opposition candidate Alexei Navalny against incumbent Sergei Sobyanin in Moscow’s mayoral election, held Sunday, Sept. 8, might have registered as either an unsettling surprise or a foregone conclusion, depending on the TV channel you watched during the campaign. Viewers of the primary state-sponsored stations, Channel One and Russia 1, could be forgiven for not knowing Navalny’s name, as it resounded so infrequently on the air over the past month. So when the near-anonymous 37 year old convicted embezzler “emerged” on Sunday evening’s flagship newscasts with an actual name and a significant vote count, there may well have been concerned murmurs in front of big-box TVs all over town: If this fellow is that popular, why haven’t we heard of him? But big box-o-vision hasn’t been the only way to watch TV in Moscow for some years now. 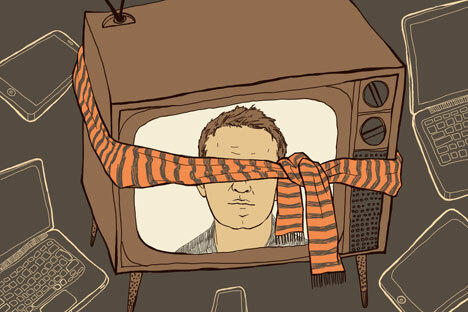 Flat-screeners have been joined by video-cadres (and voters) looking at devices on their laps, palms and wrists – people for whom television is but one electronic option on a list that alternates news monitoring with broadband communication, visual diversions and group socializing: three Navalny strengths. When the staid Sergei Sobyanin appeared on these viewers’ screens, the response was less likely “Who?” than “Why?” as the near-ubiquitous acting mayor led a campaign so innovation-free and boat un-rocking that watching it even briefly probably seemed redundant. This worlds-apart difference was well illustrated late Sunday, when the state-run Russia 24 news outlet aired coverage of an event of uncertain provenance featuring a banner-carrying crowd of thousands listening to a concert in Bolotnaya Square, a location just off the Kremlin and a popular meeting place for protest rallies. While the mayor exuded probity, two non-state-controlled viewer options – the Internet-based Dozhd TV and Echo-Moscow, a radio station with TV capability – related how the ill-defined event’s participants arrived (in group formations), where they came from (municipal facilities) and why they showed up (because they were told to – or risk being laid off, in some cases). Thus some late-night channel surfers might perceive the affair as a spillover get-together following Saturday’s City Day holiday; other viewers could (and did) see the long arm of Administrative Resources creating a partisan “victory rally” before victory had been affirmed – and using taxpayer rubles to do it. Moscow TV is in the eye of the beholder. The question now is who’s beholding – how many and for how long. Put otherwise, should the current powers-that-be, national as well as municipal, continue to assume that their control of big-box TV and its audience is sufficient unto their ends? The sizeable dent made by Navalny in the numbers projected for Sobyanin’s unrealized cakewalk victory suggests otherwise; which in turn leads to questions about just whom the people who consume media on their laps or in their palms are busy watching. Echo-Moscow is majority-owned by the state gas monopoly (Gazprom), but the station has remained editorially independent – and has engaged two TV connections in recent years to broaden its base (the RTVi network and the Setevizor company). If Echo is in fact the most popular radio station in Moscow, as was claimed in 2012, and continues serving as a regular source of audio-video air time for rising oppositionists like Navalny, can the Kremlin, City Hall and the United Russia party keep their collective hands off it? Stay tuned. The independently-owned Dozhd (Rain) TV may seem even more provocative: it provided live, sympathetic coverage of the massive opposition rallies of 2011 and has since expanded to Facebook, Twitter and Youtube – making it less vulnerable to the DDoS attacks mounted against it (and Echo). That Dmitry Medvedev signed up for, then conspicuously un-followed Dozhd’s Twitter-feed when he was president probably boosted the station’s disgruntlement-heavy audience significantly. Meanwhile, half the nation’s population used the Internet last year, and penetration will reach 79 percent by 2014: does anyone think that’s a forecast for less Rain? Something’s got to give between political reality and Moscow TV. Don’t touch that dial.